Comments: Private, open only to residents.Wet slips for powerboats. Fuel dock and restrooms. The Pier Restaurant located onsite. Comments: Private homeowner’s association marina with 142 slips. 60-foot fishing well. Comments: Wet slips only. Very small, No additional services. By Boat: Near the end of the Sandy Creek arm; the entrance to Sandy Creek is at lake mile marker 7. Comments: Covered and open wet slips; powerboats, sailboats, and T-head space for houseboats; restrooms and pump-out station. Comments: Wet slips & dry storage for sailboats only; ramp. 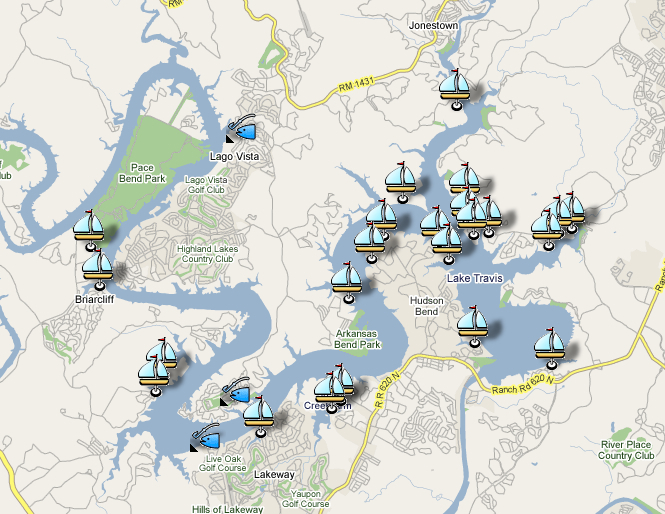 Come park your car and go sailing! By Boat: At the mouth of the Sandy Creek arm, at mile marker 7; directly across from Starnes Island and in front of Volente Beach Waterpark. Comments: 148 Covered wet slips, up to 80 feet in length. Ship’s store and deli, fuel dock, restrooms and pump-out station. Watercraft rentals onsite. Volente Beach Water Park with snack bar onsite. By Boat: Near the end of the Cypress Creek arm; the entrance to Cypress Creek is just before lake mile marker 6, around the corner from Bob Wentz Park at Windy Point (which is at mile marker 5). Comments: Uncovered wet slips for sailboats. Dry stack and covered/uncovered wet slips for power boats. Comments: Covered/uncovered wet slips for powerboat and sailboats, Drystack for powerboats. Comments: Full service marina Gasoline & marine supplies. Wet slips and dry stack storage available. 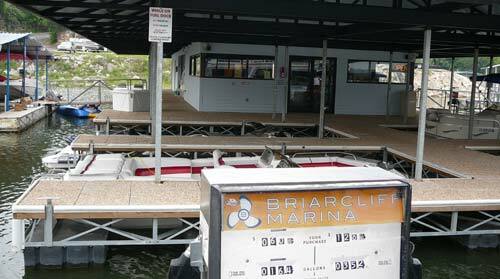 Comments: Wet slips only; fuel and pump-out station; one of the few marinas with diesel fuel. Comments: Leased and owned covered wet slips for powerboats, 20 to 50 feet in length. Electric, water, phone and cable available. Fuel dock, pump-out station and ship’s store. Comments: Covered wet slips for powerboats plus a 340-slot covered, enclosed dry stack. Slips come with or without electricity, water, and cable. Slips range from 20 to 60 feet, and can accommodate houseboats. Exclusive dealer for Hydrohoist boatlifts, offering sales, installation and rentals. Eriksen Marine located onsite. Next door to Carlos 'N Charlies restaurant. Comments: Covered powerboat slips, uncovered and T-head slips for sailboats. 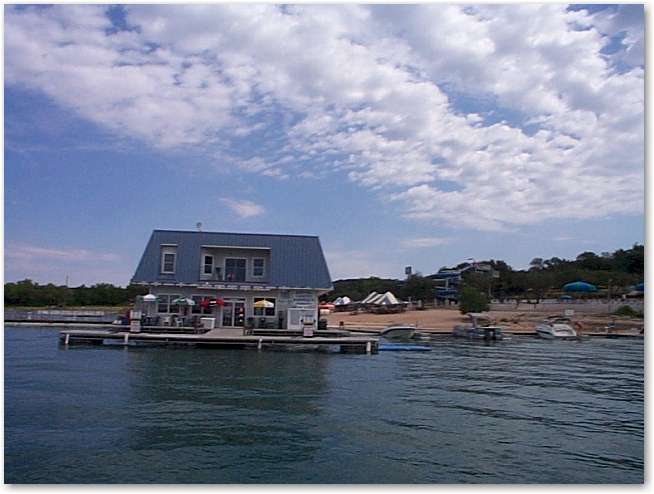 Water/power/cable at each slip, restroom & shower facilities, private park & swimming beach, trailer storage, and more. Comments: Wet (covered and uncovered) and dry slips for powerboats and sailboats. Sailboat slips up to 42 ft long, covered slips to 34 feet. Dry dock up to 36,000 lbs. Restrooms and showers, pump-out station. Comments: Covered wet slips up to 80 feet long for powerboats and houseboats. Enclosed dry stack storage for boats up to 25 feet in length. Ship’s store and fuel dock. Full service marine maintenance facility. Johnny Fin’s restaurant onsite. Comments: Permanent or daily slip rentals. Full service repair facility. Ship’s store and fuel dock. Watercraft rentals and charters available onsite. 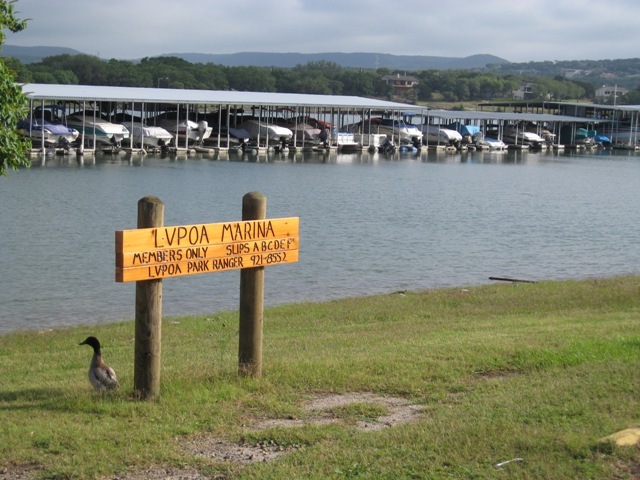 By Boat: Located in Rough Hollow cove, at lake mile marker 18. Comments: 100+ Wet slips. Ship store, fuel dock, pump-out station, electricity and water, restrooms. Gated access. Located in a large cove well beyond the No Wake buoys. Adjacent to a great restaurant – the Lakehouse Café. 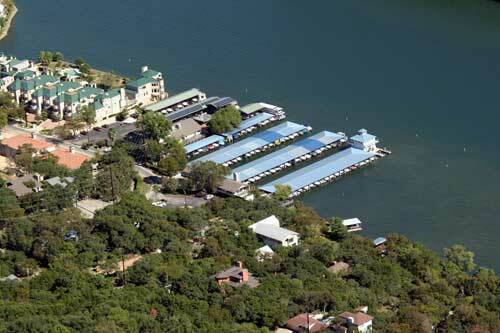 Located near the Tom Miller Dam on the west shore of Lake Austin, the Lake Austin Marina is Austin's premier full-service marina and office park. Features 168 boat slips of varying sizes and features, as well as a Ship Store, on-site mechanical services, and boat detailing.